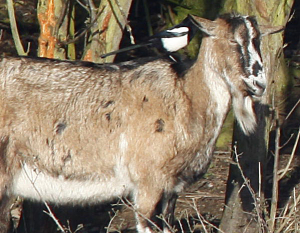 Observation - magpie on goat's back - UK and Ireland. Description: magpie presumably collecting goat's fur? goats are used for habitat management left on the island. magpie presumably collecting goat's fur? goats are used for habitat management left on the island.